Shawn Corey Carter (born December 4, 1969), kent bi his stage name Jay-Z (sometimes stylized as Jay Z, or JAY Z), is an American rapper, singer, songwriter, record producer, record executive, actor, businessman, entrepreneur, investor, and philanthropist. ↑ Birchmeier, Jason. 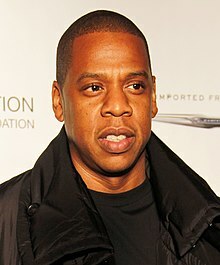 "Artist Biography [Jay-z]". AllMusic.com. Retrieved 2014-05-12. ↑ "Jay Z officially drops the hyphen from his name". NME. IPC Media Entertainment Network. Retrieved July 18, 2013. ↑ Krishnamurthy, Sowmya (July 18, 2013). "Jay-Z Officially Drops Hyphen To Become Jay Z". MTV News. Retrieved July 18, 2013. ↑ Michaels, Sean (July 19, 2013). "Jay-Z to become Jay Z in massively disrespectful move against hyphens". The Guardian. London. Retrieved July 19, 2013.